The JP Boyd on Family Law Blog provides updates and commentary on family law developments, and is curated by Collaborative Divorce Vancouver. 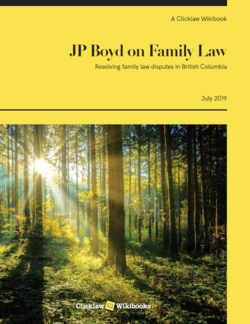 Written in plain language, with rollover definitions for legal words and phrases, JP Boyd on Family Law provides practical, in-depth coverage of family law and divorce law in British Columbia. This trusted source for family law information is based on John-Paul Boyd's popular website, BC Family Law Resource, and is completely updated for the Family Law Act. To get started, read Family Law in British Columbia for a quick introduction. Then dive into the main chapters of the wikibook, or see the How Do I? section for answers to common procedural questions. Read about the transition of this resource to a wiki format. View the many lawyers and judges who are part of the editorial team led by Megan Ellis QC that keep this resource updated. This page was last edited on 26 March 2019, at 15:12.